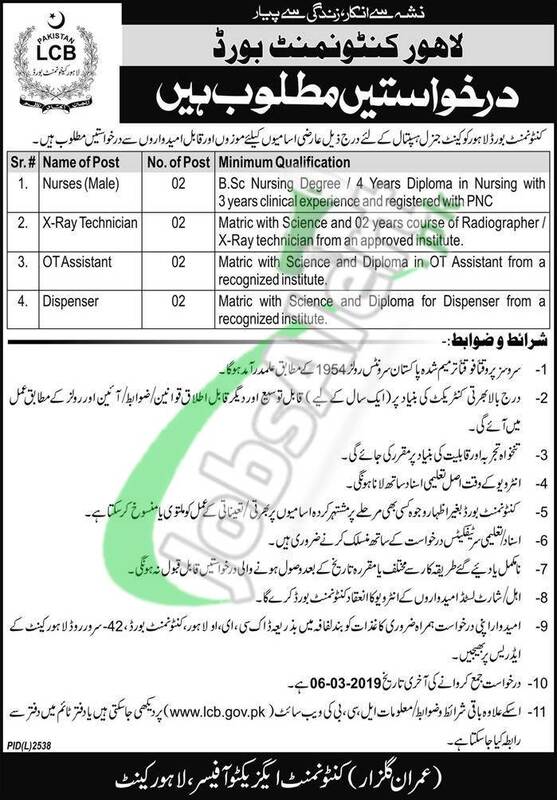 Here in the following we'll discuss about Lahore Cantonment Board Jobs 2019 Latest Advertisement announced Lahore Domiciled male & female who are welcome to apply for the following positions. Candidates are welcome to apply for the posts such as (Nurses (Male), X-Ray Technician, OT Assistant, Dispenser) based at Cantt. General Hospital Lahore and recruit on contract basis. Candidates possessing qualification from Bachelors to Matric in the relevant discipline as per the demand of vacancies are welcome to apply before the last date 06th March 2019.